Midlands photographer Charles Hite will tell you a picture needs no words to tell a story. Hite’s work is getting increasing attention, but his real joy is in feeling closer to God with every frame. Where others see a picture, photographer Charles Hite sees a story. They are pictures like those he’s taken of the old St. Simon’s Episcopal Church in Peak, along the Broad River northwest of Columbia. The church, established in the late 1800s, was abandoned during the Great Depression of the 1920s. Learn from writer Darren Rowse of the Digital Photography School how best to pick a DSLR camera to shoot with. Find out more about Charles Hite and his work at his website. Read up on some tips to photograph your own landscape pictures. “I came to see the church, and I was just in awe of how old it was. I couldn’t help but think, ‘What happened to it?’” Hite says. Since Hite, 65, put down his surveying and mapping tools for a camera more than 10 years ago, his work has gotten increasing notice. His photos are for sale at the Nest gift shop in downtown Columbia, and they hang on the walls of the Hyatt Place on Gervais and Henry’s Bar and Grill on Devine Street. His photos were also part of Columbia Metropolitan Airport’s Arts at the Airport exhibit in late 2014. Hite’s were the only photographs featured. The 2012-2013 Cayce city calendar also featured one of his pictures on the cover and a few inside. In addition to having his work chosen for the cover of the 2012-13 Cayce calendar, Midlands photographer Charles Hite’s photo of the Cayce Historical Museum was used to illustrate December. Hite “has an appreciation for local nature that comes across so well in his photos,” says Nest owner Emile DeFelice, who also runs the weekend Soda City Market on Main Street. 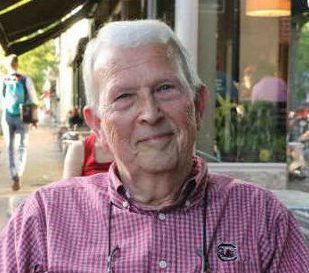 Hite says he tried several jobs after graduating from Brookland-Cayce High School in 1967 before getting a degree in land surveying and mapping from Midlands Tech. But discovering photography, he says, gave him a spiritual direction. “I love old buildings, old structures. There’s something about them that makes me interested,” he says. Hite seeks them out on photography day trips with his wife. These trips also often take them out into nature, one of Hite’s favorite places to be. “I used to be in such a rush, never stopping to appreciate what was all around me,” he says. Charles Hite displays a photo of a field in the Columbia area he took in infrared – a new technique the Midlands photographer has been trying. Hite says the technical nature of his earlier career helped once he took up photography full time. Hite says he wasn’t always so open to sharing his work until family and friends urged him to try selling some of it. “My wife was especially persistent about that,” he says with a laugh. That also allowed him to share the stories behind the photos. “I love selling at the Soda City Market and having people ask me questions about the pictures,” Hite says.